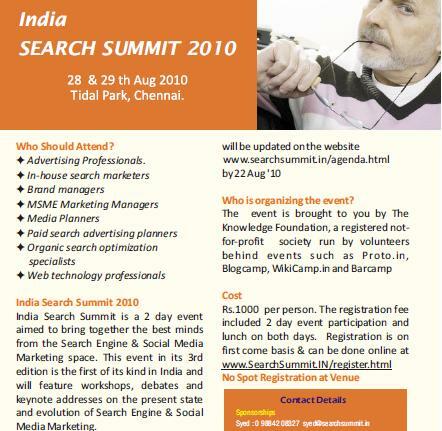 India’s premier event on Search Engine Optimisation and Search Marketing called SearchCamp just got a total makeover and rechristened as India search Summit ( http://www.searchsummit.in ) . The event has been a not to miss networking opportunity among Search Professionals which just got bigger with inclusion of Social media tracks with this edition. The two day event will be peppered with regular tracks on latest trends , techniques related to SEO and SEM . Off late India is proving to be a top outsourcing destination for Search related work and corporates across India are taking to Search in a big way. Social Media has emerged as a major online branding tool for corporates to reach to existing customers as well as means to attract new customers. Companies like Vodafone with their ZooZoo campaign, Tata Docomo , Fastrack , Chings Secret, Amul, Cleartrip, Idea have been going all guns blazing on the Social Media. Then there are companies that scan all social media channels like Twitter , facebook to sense dissonance related to their brands and get in touch with such unsatisfied customers. Recruitment organizations have been prowling online at medium like Linkedin to get feedback from experts on their products as well as to acquire talent from the market. The sessions would revolve around best practices in the industry followed by case studies and discussion on different tools used by professionals to pursue this religiously. This two day event has a lot of listed sessions but my experience has been at the innumerable unlisted discussion that emanate on the corridors while networking with such professionals. I am not a Search Professional but i will be there bcos i would like to hear and learn something new . How about you ?